Then, go professional and distribute your next HTML5-powered masterpiece to the masses. The free Hobbyist Edition lets you use the full functionality of the Alchemium platform for an unlimited period. When you are ready to distribute your HTML5-powered masterpiece, purchase the professional version for just $99.99. The professional version grants you unlimited royalty-free distribution rights. Build native desktop applications that harness the power and speed of Alchemium's embedded, Chromium-powered engine. 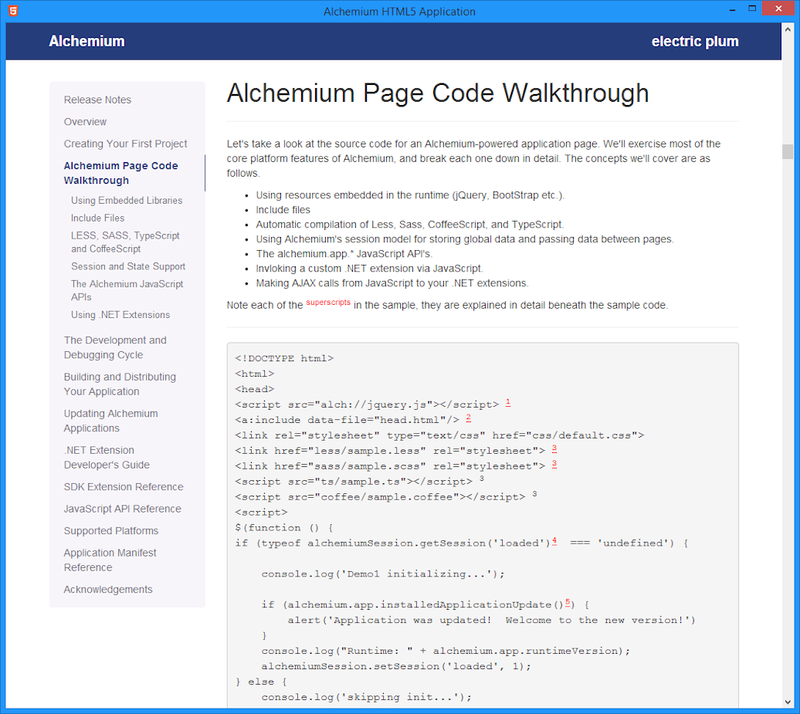 Alchemium is built from a specially tweaked version of Google's Chromium Engine. Take advantage of emerging technologies like Web Sockets, Accelerated WebGL and Web Audio. 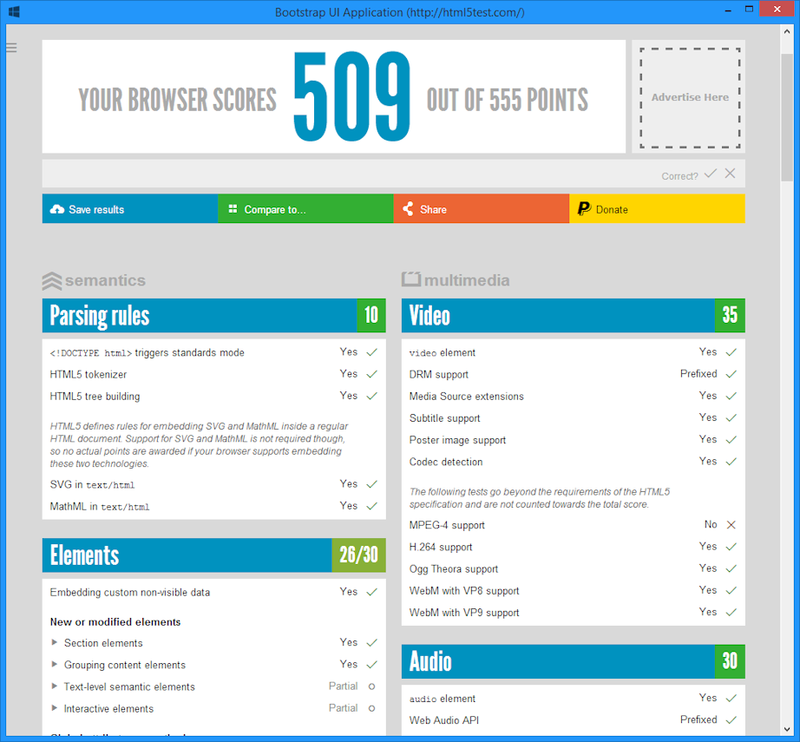 Alchemium scores an impressive 509 on the HTML5 test (try your browser and see how it compares to Alchemium), so you can be sure that all emerging and bleeding edge HTML5 technologies are at your disposal - with no worries about browser compatibility. In addition, since your application is running native, all traditional browser security sandboxes are removed for maximum flexibility. 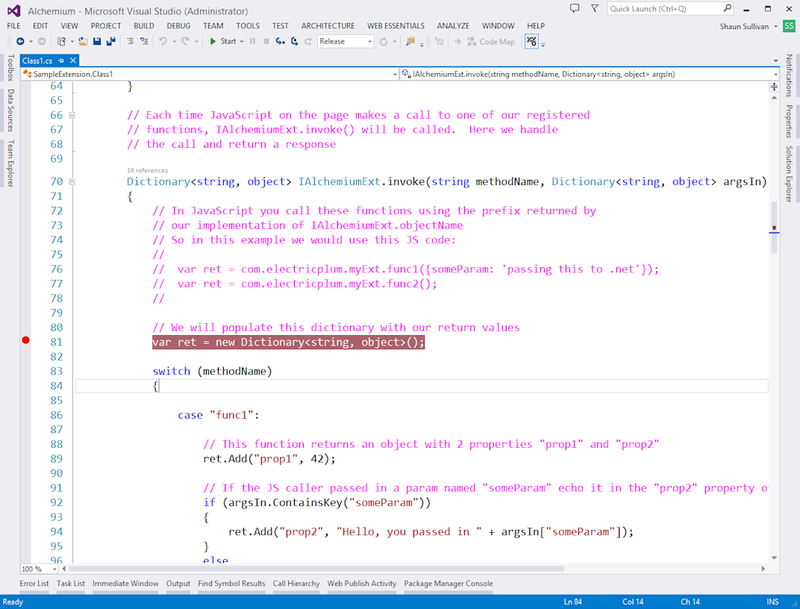 LESS, Sass, CoffeScript, and TypeScript with "Live Edit"
Alchemium's static compilation engine includes automatic support for these popular tools and language enhancements. Nothing to download, nothing to include. Simply write your LESS/Sass/TypeScript/CoffeeScript and Alchemium handles the compilation and generation. Live edit lets you launch your Alchemium application and open up your editor of choice. As you make changes in the editor, Alchemium detects the changes and dependencies, and recompiles/reloads content in real time. The perfect environment for rapid prototyping and development. 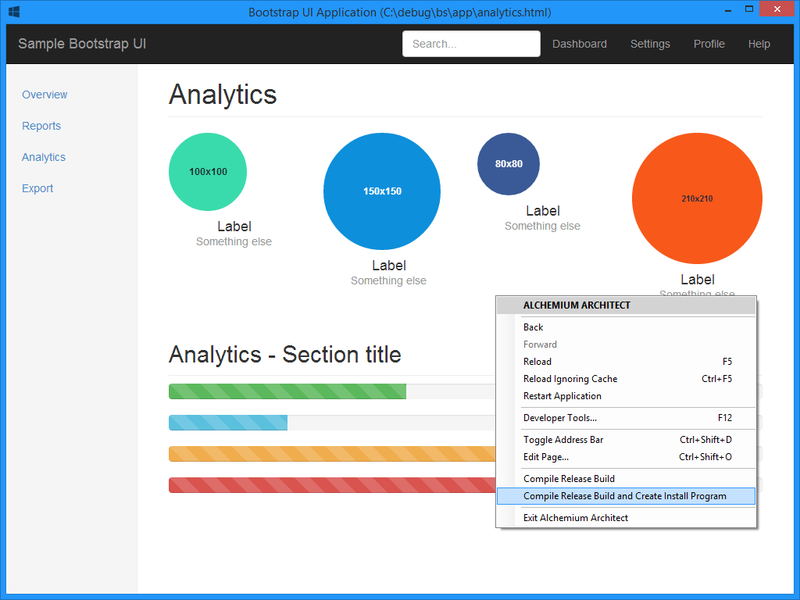 Chromium's powerful developer tools are embedded in the platform offering a full debugger and content development/inspection toolset. If you are comfortable with Chrome development tools, you'll be right at home with Alchemium. Alchemium supports fully accelerated WebGL, accelerated Canvas compositing, and Web Audio. Take an existing HTML5 game and package it up for delivery as a native application in just minutes. 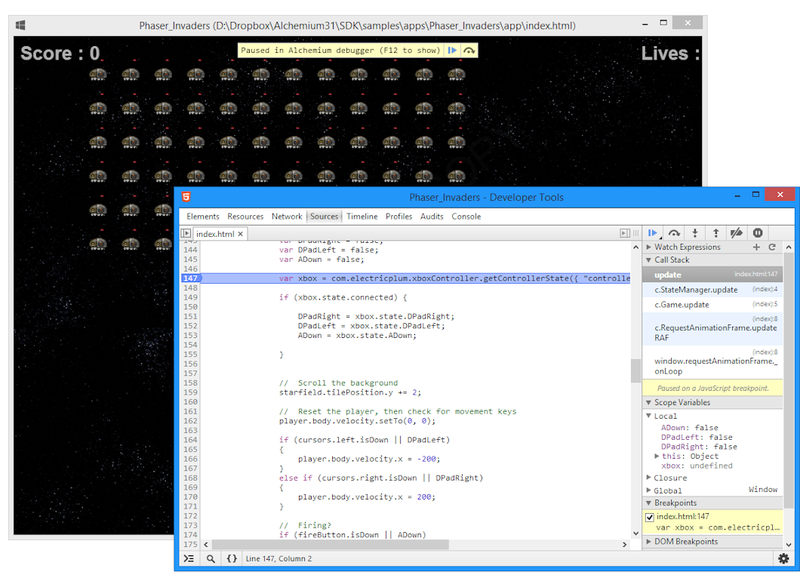 Harness the XBox 360 Controller extension to bring native-quality controls to your HTML5 games. 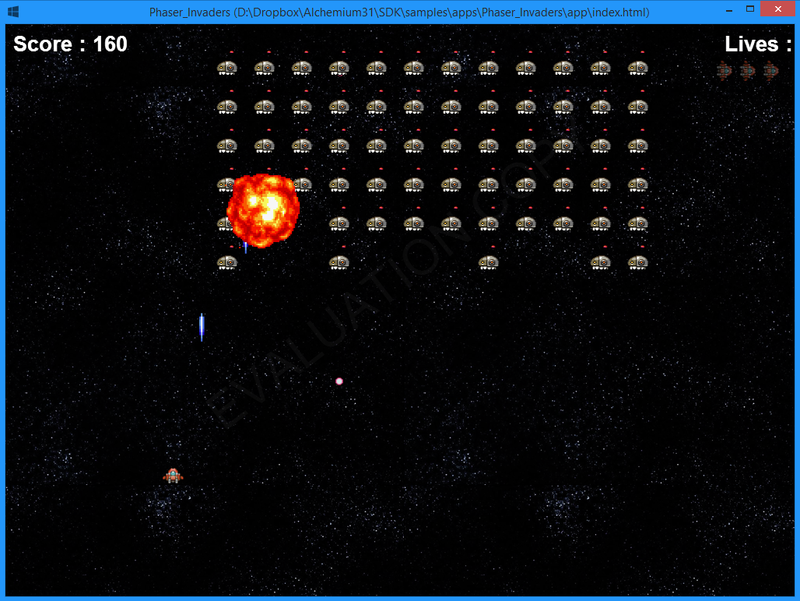 Alchemium works great with all popular HTML5 game engines and shines in particular when using WebGL accelerated engines like pixi.js and Phaser. We know there is nothing more frustrating than being excited to use a new technology only to find sparse documentation and "hello world" quality samples. We documented every nook and cranny of Alchemium with 51+ pages of deep dives into the platform. The SDK includes a number of samples, including functional HTML5 applications and games. Ready to ship? Simply right-click on your application and select the appropriate command. Alchemium will generate a commercial-grade Windows installer for your application. The installer handles application installation and deploys any dependencies. No more hassles with writing installation scripts. Deploy to any version of Windows from XP through Windows 8.1 (Desktop). Popular libraries such as Angular.js, Bootstrap jQuery, Underscore and more are all embedded directly into the runtime and accessed using the alch:// protocol, making it easier than ever to use them. Of course you are free to include your own libraries or custom versions. Use the powerful <a:include/> as a marker to dynamically inject markup and code into pages for maximizing code and content re-use. 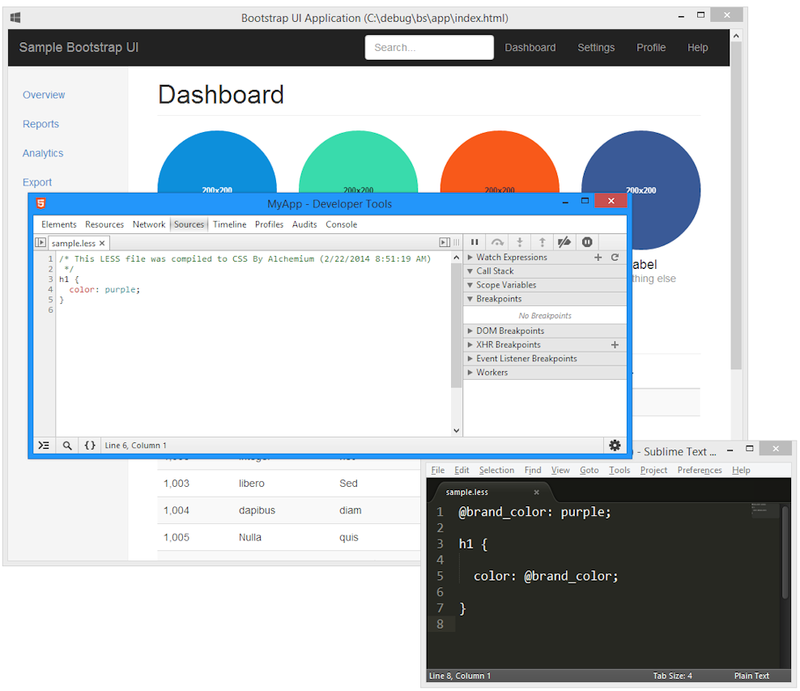 Alchemium brings server-side paradigms to your desktop applications. Use the power of Alchemium, Sass, Less and more to dynamically generate static web content. It's a great way to build contemporary, fast Web sites that are easy to deploy and scale.